A dessert bridal shower theme is an event based around assorted goodies. It is great for an afternoon or evening shower. It also works well as a couples theme. It can be adapted to suit a large or small crowd, and is budget-friendly. So, let's take a look at this tempting idea. There are several ways to carry out your plans. 1. Make or purchase an assortment of desserts. Serve buffet style. 2. Preselect a variety of desserts to be served at a restaurant. 3. Ask each guest to bring their favorite dessert. Depending on the number of guests, a private home may be the perfect location. Do you envision gourmet desserts being served table-side? Then a restaurant or hall may be your choice. Select invitations that relay your theme. 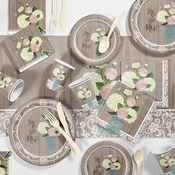 A delicious dessert motif will convey this idea. Let guests know where the couple is registered, if possible. If you are asking them to bring a homemade dessert, suggest bringing the recipe written on a card, to be given to the bride. Your decorations can be bright and dramatic, or soft and romantic. Choose your color scheme. 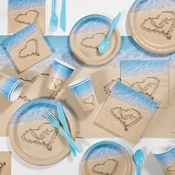 Then use it for balloons, banners, streamers, flowers, and tableware. A chocolate fountain makes a great dessert bridal shower centerpiece for this theme. 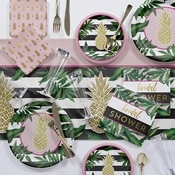 The dessert plates above are some of the styles available at Napkins.com. You can focus on one type of dessert, or use a mixed assortment. You may decide to have several stations. You could arrange tables by color or type of dessert. • How about a do-it-yourself sundae station with choice of toppings? 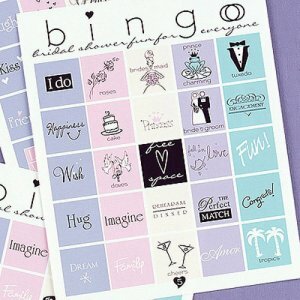 • Games for your dessert bridal shower theme party. This kit includes five different games. These will easily fit in with most events. You can choose music based on the mood of your party. It can be lively or soft. A restaurant might have a piano player, or other type of entertainment available. Another idea for this theme is to have some type of demonstration...maybe a representative from a bakery, a patisserie chef from a local restaurant, or a hands on class for a small group of guests. *** If guests bring recipes, assemble them into a book or recipe file, and give to the bride. • Need more party themes? • Go from dessert page, to Bridal Shower Ideas For You homepage.